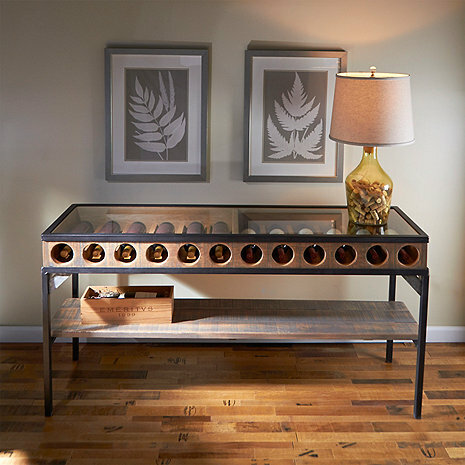 A perfect combination of elegance and design, the Wine Bottle Display Console Table features storage for 12 wine bottles displayed under a clear glass table top. Proudly showcase your favorite decorative labels and bottles with a one of a kind piece of wine barrel furniture sure to be a conversation starter at your next get-together. Made from hand worked steel and rough hewn white oak with a distressed finish and bracing made from actual retired wine barrel hoops. Made in the USA. How wide are the individual spaces for wine storage? Could you fit a wider bottle like a pinot noir in there or just slim ones as shown? BEST ANSWER: Tawnie--The diameter is 3.5 inches. Big enough for all the bottles I've placed (including Pinot Noir), and of course with the glass top off, you can then place the bottles directly into the somewhat larger compartment. I simply use this to display a wine collection. It would be cumbersome to use it to store wine that you are frequently replacing, as pulling the bottle back out of the hole is a little tricky (could maybe just be my chubby fingers). Moreover, for a display like this, it seems a bit strange to me to have all the labels upside down, so I have mine placed with the bottom of the bottle toward the hole--this of course really makes it difficult to pull out a bottle through the hole! Bottles up to 3 1/2" will fit easily in the slots. what kind of wood is it and what is the weight of the table ? are the compartments for the wine bottles slanted so that the corks do not dry out? BEST ANSWER: Wine is stored horizontally so the corks remain moist and this is also a wonderful and unique design. Wine is stored horizontally so the corks remain moist and this is also a wonderful and unique design. What is the diameter of the holes? The table was delivered with some minor assembly required. It was wrapped very well and the glass incredibly well protected. At first we thought it was a bit shorter than we'd wanted but once we had it fully set up we really like it. It is perfect for the location and use we wanted. The only negative is that the metal braces that connect the legs to the wood case on each corner show in the front and the back and they are light metal not dark iron like the other parts of the piece. This table is the right design for displaying wine bottles with a rustic look. However, the construction is significantly lacking. Inch-wide holes in the wood (not knots) at some supportive joints and nails sticking through the wood more than an inch in a couple of places and into the display areas, etc. So, this table was returned for sloppy construction. Since these obvious issues passed whatever inspection the manufacturer would have done, NOT ordering another one.